The Delaware & Lehigh National Heritage Corridor was established by the United States Congress in 1988 for its important history and rich and distinctive historic and natural resources. The Corridor showcases the Delaware, Lehigh and Wyoming Valleys where anthracite coal was discovered, canals were built and iron was first poured. 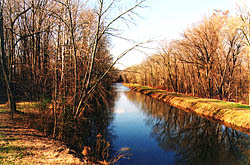 The Delaware & Lehigh National Heritage Corridor, which is also a State Heritage Park, is a joint effort of private groups and interested citizens, county and municipal governments, the Commonwealth of Pennsylvania and the Federal government to conserve its historic and natural resources, and provide appropriate development opportunities for a sustainable future. The National Heritage Corridor is recognized as an innovative and effective way to conserve our nation's heritage and fulfill the mission of bringing the benefits of national parks close to the largest population concentration in America. Many benefit from this effort, including nearly half a million students in schools and colleges who learn in the living museum surrounding them, a museum of history, sociology, geography, economy, geology, wildlife and botany. Local businesses benefit from the renewal of downtowns, and the restoration and adaptive use of the region's historic buildings. Residents are able to see their way of life protected and take renewed pride in their unique heritage as individuals and as communities. To this end, Pennsylvania Heritage Park funding was recently awarded to projects within the Corridor that will stimulate regional economic development, preservation and heritage tourism. 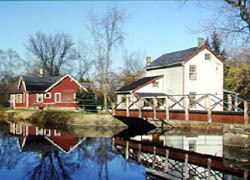 In historic downtown Bristol projects include the construction of a visitor's gateway entrance and courtyard at the Canal's End Reach and construction and improvements to the Delaware Canal area near Lock #4. Portions of the Lehigh Canal in Carbon County are slated for preservation, stabilization and new signs to identify historic structures. Various towns and cities will receive technical assistance to help conserve environmental, scenic, cultural, historic and recreational resources in the Corridor. Today the Corridor's extraordinary natural, cultural and recreational resources give us a living "national park" where people reside, work and share the responsibility of its preservation. Multitudes of visitors, drawn by the "real places" and the amazing evolution of landscapes, may discover rivers, mines and company mining towns, canals and canal towns, railroads and other related resources encompassed by the Corridor. The region is a veritable microcosm of the nation's historical development. Excerpted from "Along the Corridor," newsletter of the The Delaware & Lehigh National Heritage Corridor, the Management Action Plan of the Delaware & Lehigh National Heritage Corridor, and information provided by Sue Pridemore, Chief of Visitor Services for the Delaware & Lehigh National Heritage Corridor Commission.